Hi! It’s Jenny from Everyday Jenny. Did you get a new Cricut under your tree this year? Yippee! Now that you have your machine I’m sure you are excited to make all the things. But what else do you need to make your project perfect? There are endless possibilities of things you can make with your Cricut. These three items are a great place to start for all crafting needs. I love this option to get a variety of the mats to hold all sorts of materials. You can test out cutting different types of materials with each mat. You may find you like a certain grip better than another. The tool set is perfect for lots of crafts you will be making. I have used each of these tools many times, so the bundle is a great deal. I especially love the trimmer to cut a perfectly straight edge on my materials and the scraper to clean off my mats. 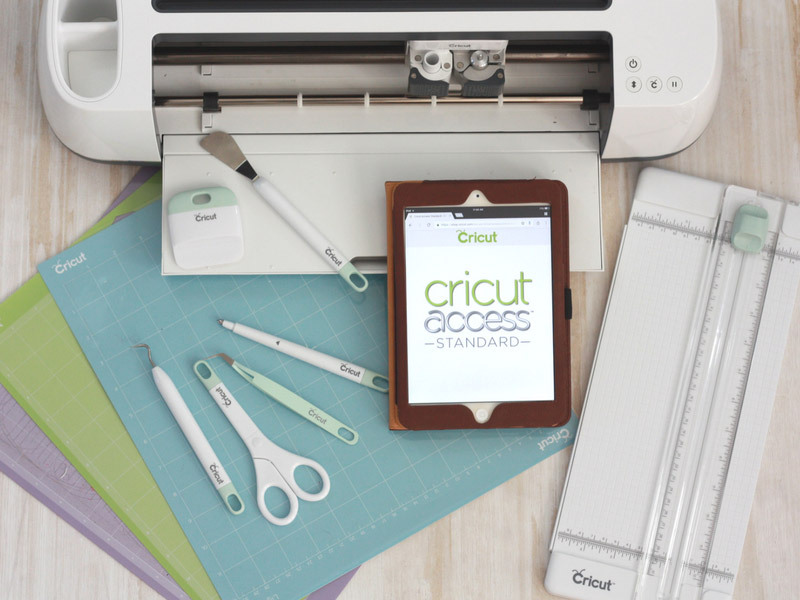 When you purchase Cricut Access you have unlimited access to over 30,000 images and 1,000 projects, plus over 370 Cricut Access Fonts. Cricut Ready-to-Make Projects are a great way to get your feet wet and try out projects that have already been created for you by professional artists. Once you have a few projects under your belt you will gain confidence to continue creating. What’s your favorite Ready-to-Make Project? Let me know in the comments below. Now that I have gone over those items, here’s a list of essentials depending on the type of crafts you are planning on making with your machine. If you find that you want to focus on one area of crafting then these are for you. Vinyl is such an easy and fun material to work with. You can create signs, decals, organize with removable labels, and much more. If you know you want to work with vinyl, this sampler set is a great place to start. Get multiple colors to try out for lots of different projects. Along with the essential tool set, I love this weeding set for vinyl projects because vinyl cuts can be really intricate. These tools are perfect for even the tiniest pieces of vinyl. The BrightPad makes weeding much easier by illuminating the fine lines and helps to reduce eyestrain. It has five brightness settings and is nice and lightweight. If you customize everything from t-shirts to socks, then you probably love iron-on. (I think this is probably my favorite material!) Not only can you apply iron-on to fabric, you can also use it to wood, canvas and even some types of paper! Start with a few basic colors of Cricut Iron-on lite. Once you are comfortable working with this material, there is even holographic sparkle and glitter iron-on which are so much fun. A Cricut EasyPress is an essential tool for iron-on application. The EasyPress gives you professional results and is lightweight and easy to store. I have loved making projects with my EasyPress. Do you love making cards for your friends and family? 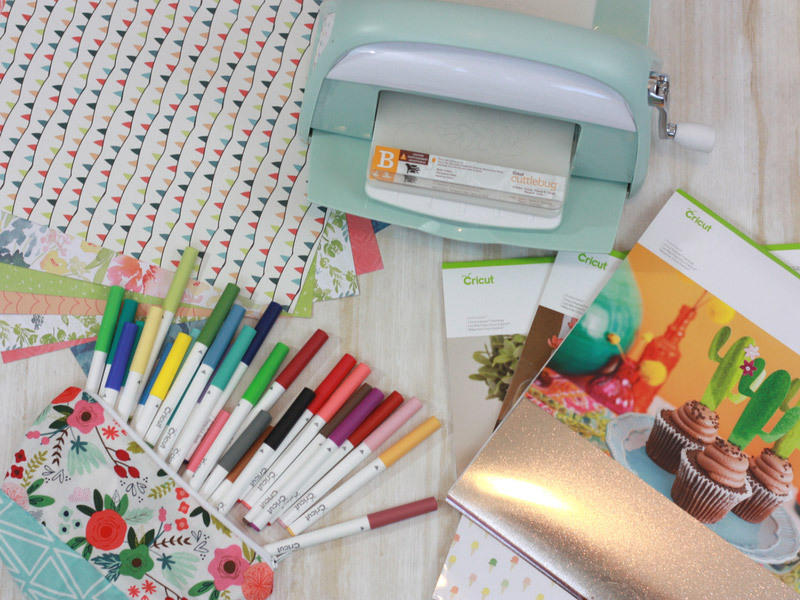 If you will be making mostly paper crafts, you will want some of these essentials to make your paper crafts shine! I love the variety of Cricut scrapbook paper. There are so many fun patterns and colors to choose from that you will want to buy a few different packs. Add writing and colorful script to your cards with Cricut pens. You can even use them to address envelopes. 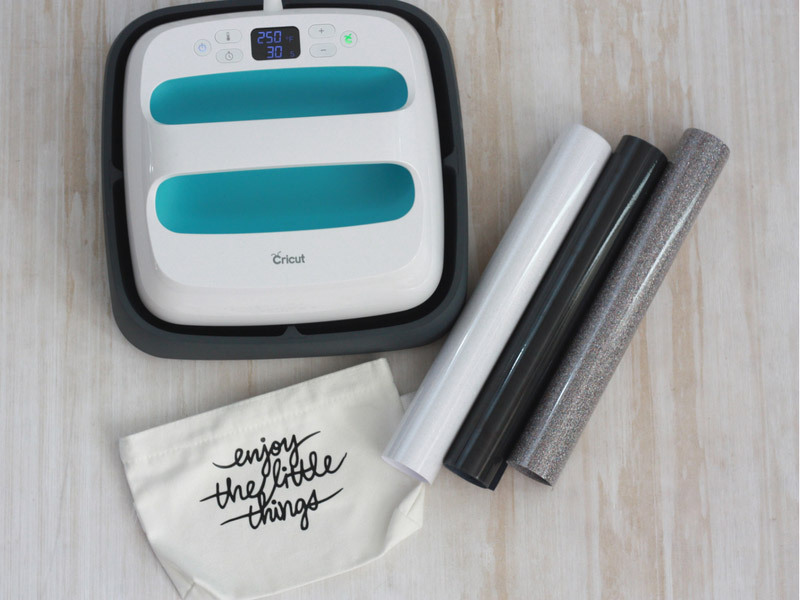 This machine is great for embossing a wide variety of materials and adding those perfect touches to your paper crafts. It’s a great companion for your paper crafting needs. 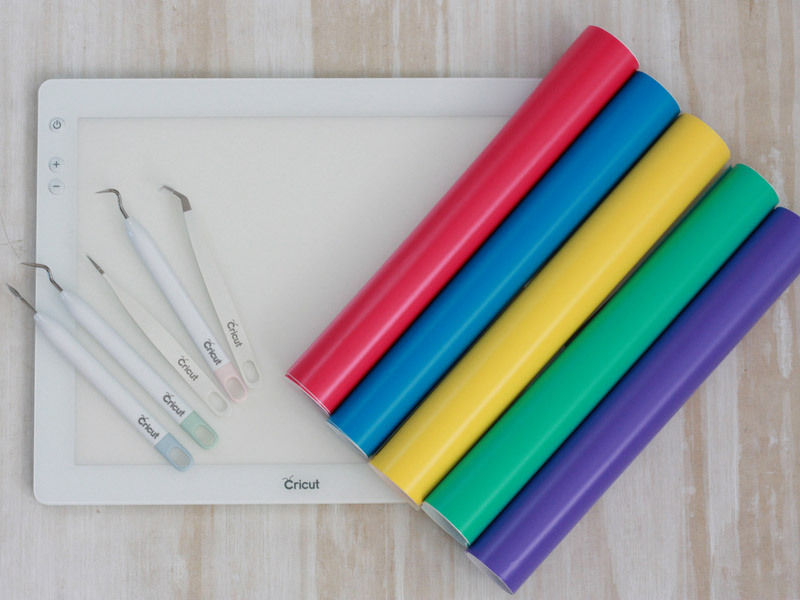 If you got the Cricut Maker for its awesome rotary blade and are planning on sewing up a storm, then you will want some of these amazing sewing essentials. This kit comes with fabric shears, thread snips, seam ripper, pincushion and pins, measuring tape and a thimble. All of these items you will need if you are just building up your sewing stash. 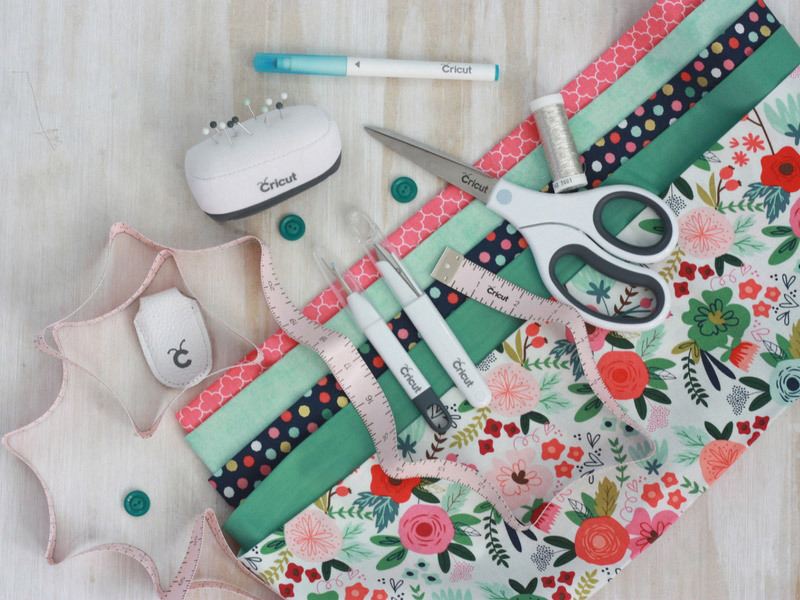 Cute, coordinating fabric is a no-brainer to inspire your sewing projects. I especially love the Creative Rockstar and On Trend Sampler sets. Use this pen to easily draw out your patterns with your machine, making sewing a snap! I hope this helped you to narrow down some of the fun items you are have been wondering about! Also, as one last suggestion, if you will be taking your Cricut places with you, or just want a great place to store it when it’s not in use then you also might want to consider this great rolling craft tote. Have fun making all the things! When will the knife blade be available for the Cricut Maker? I’ve been asking that question for over a month. One of the reasons that my husband bought the Maker for me was because of the projects that could potentially be done using that blade. I love my Cricut. I live in Australia and would love to be able to access Cricut subscription as I find I’m unable to access a lot of designs. Love all these great Cricut accessories! Can’t wait to use my vinyl cutter on this snowy cold day! Where is the best place to buy Cricut supplies that s not expensive?I live in Pa.
Michael’s currently has Cricut supplies buy 1 get 1 1/2 off. I purchased the Maker in early October and I have been waiting for the knife blade which I understood from HSN program hosts would be available by late October. Cricut then changed the release date to December. Now, Cricut is saying it will be released in 2018. That could be any time in 12 months. The only reason I purchased the Maker was for the knife blade so I am not happy with Cricut. The demo clearly shows the knife blade being used so I am not sure why these have not been produced. Cricut Maker customers are continuously being misled. For the umpteenth time – When will the knife blade be available? Hello, i have a question! Do all theese equipment come in together with the cricut or you have to buy them extra? Hi. These are additional supplies that can help you have the best crafting experience. Minha Cricut Make está vindo dos EUA. Estou ansiosa para que chegue logo. Com certeza vou precisar de orientações que possam me passar. I have been a Cricut user for several years. I helped both of my daughters purchase theirs and have had access to theirs. When the maker came out, I watched the videos for several weeks before I purchased mine. The reason for getting the maker was because it could do so much more than the ones my daughters had. The videos show so much, and even talk up design space to paint a prettier picture, yet when you buy it, you almost have a blank canvas. Having to wait for the new blade is a good thing if they are going to produce the blade promised, but my goodness, how long does it take. I as so disappointed, I feel like if you are wanting to sew or make cards, this is the machine for you. Otherwise, I feel like I just have a machine that can cut. I wish I had waited or done more investigating into other cutters. I have used this machine twice since January, once with the project that was included, and I cut out Happy Valentines Day. I am watching videos to get more acquainted with this machine, but I’m not sure it wants to be my friend. Would give it back if I could, and find something else.$400.00 is a lot of money for it to just sit on my crafting table. Hi. We have webinars that can help you get started. YouTube is a good resource, and there are many blogs and Facebook groups that can teach you different skills. Good luck and happy crafting! The JoAnn’s store here has classes. I also have the same question, my husband bought me the creator thinking about the big difference with the other machines, but in reality I do not see any until now because they are not clear when the new knife is ready, it is very disappointing actually . Before making this purchase I just want to know if the machine can make iron on labels for kids’ colthing for school or nursery and if so what is the name of the material I need to purchase. PS. Cricut team shame on you for ignoring all these customers queries about the blade. Now you’ve made me weary. You could use printable iron-on to make these labels. Fabric labels can be made without the cricut machine … just use an iron instead of the cricut press. There is nothing in this video that uses the cricut machine, except the easy press, which is just an over priced iron. Has anyone noticed that the new standard mats are very sticky. Hi, Im Clarisa from México City. Yes, I think so too. I have already torn a couple of projects, specually small pieces. And if you place the wrong paper by mistake, you wont get it back cause its so hard to peel it out, I gets so wrinkled. Purchased Cricut explore air 2 recently… unfortunately they do not support their product in Australia and I can’t purchase designs!!! I have a project I was wanting to do bv that requires to print in an ink jet printer. I have looked into it and it said I needed to download Cricut Basics. But I can not find it for and Android users. All I can find is for Apple products. I don’t care for them personally. Is there a link or date when it will be available? What size mats are best? The one I’m buying says it comes with the fabric mat and the light grip mat in 12 x 12 but wanted to purchase a variety pack. They have an option of 12 x 24 or 12 x 12, which would you get or what would I need the larger one for? Hi. It depends on how large of a project you would like to cut. The longer mats allow you to create bigger projects. The purple StrongGrip is good for heavier materials like leather, chipboard and more. Can someone help please? I have a new Cricut Maker and every time I press “cut”, it starts off OK and then at different stages, quarter/hakf/three quarters, the cutting stops and freezes. Nothing I can do but switch off and start again. Then next time it may cut a bit further. This surely is not right. I also frequently get a message pop up that Design Space isn’t working do I want to wsit/report/close. I am using my mobile phone for design space. Can anyone recommend a tablet that will be compatible with Cricut. Hubby bought me a Kindle Fire just for that purpose and it is no good. So many teething issues, and I just want to crack on. Hi. Sorry you are having problems. We have apps for both iPads/iPhones and Android devices. What are you trying to cut?